When TriMet announced last year they would be investing in five electric busses, I was ecstatic to see TriMet make a serious investment in a fleet powered by alternative fuels. Yes, TriMet’s existing fleet uses a Biodiesel blend, but I was shocked how behind TriMet’s bus fleet was compared to Philly’s. When I first moved here, I heard from many that Portland was supposed to be a very progressive city, and yet while Philly’s bus fleet was almost entirely hybrids, TriMet was still on diesel. 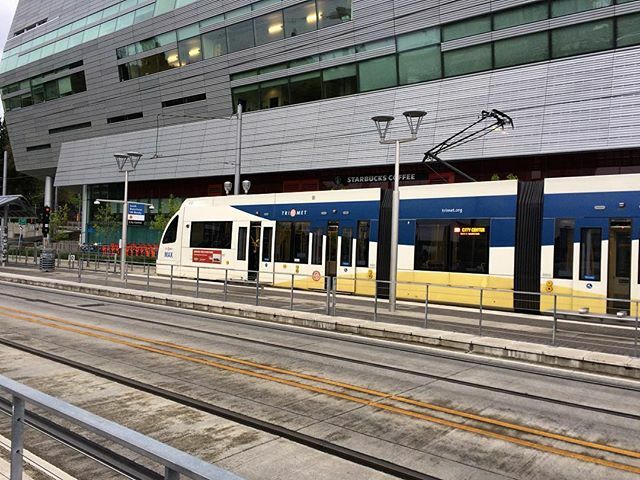 When I did arrive in Portland in 2015, TriMet had just ordered a small number of hybrids, one of which I finally caught on line 9 last month. TriMet’s electric bus was originally marketed as expected to enter service in Fall of last year. While it did arrive in Portland, it wasn’t until earlier this month it finally went in to revenue service, with no announcement at all. In fact, TriMet still lists the electric busses as “coming soon” on their website. This past Sunday, I took the first – and only – in service for a ride, bus 3801. No familiar Gillig badge for 3801. While its blue paint scheme won’t stick out nearly as much now that TriMet has put the 3900s in service, with their orange stripes at the end of the bus, the exterior of the bus is a bit different from the rest of the fleet. That is to be expected though, as TriMet’s electric bus is a NewFlyer Xcelsior Charge, while the vast majority of the fleet are now Gillig BRTs. Besides the taller top for the battery packs, the front of the bus is also much flatter than the rest of the fleet, resulting in the Hop validator being mounted higher than normal on a pole due to a much smaller dashboard. There are no side windows at the front either. Cyclists will likely welcome the new bike rack, which now fits a third additional bike. The front half of 3801’s interior. Inside, the layout of the bus is mostly familiar, but there are some very noticable differences. While I wasn’t about to take a tape measure out, the front aisle feels significantly more narrow than before. I find this ironic, as the bus has the widest back door of the entire fleet, wide enough I suspect you could fit a wheelchair through it without much difficulty. For those who, like me, absolutely hate the “Touch Here to Open” strips the 3900s and some older busses have, you’ll be happy to know the strips on the 3800s actually work – you just have to be a little patient. Touch for a full second without pushing, and the doors will gracefully glide open and closed. If you’re one of the people that like to stand in the rear doorway (please don’t), watch out, as the doors open inwards instead of outwards. The back door isn’t the only thing towards the back of the bus that is very different. The steps to the raised section also have a slight angle to them, and the very back of the bus is completely changed. Instead of two to three seats facing each other right before the last row, you’ll find only a single seat on each side turned inwards, and one more row of seats facing the front before the last row. Surprisingly, leg room is actually still decent, far more than you’ll get on a Type 4 MAX for sure. Headroom, however, watch out for, as the lights slope down because of the battery packs on the roof. If you go for a window seat in the raised section, you may bump one slightly. That said, also don’t expect a view out the window in the raised section. Yes, I’m one of the people that prefer to stare out the window on the bus, not at my phone. In the raised section, the split in the window so you can open it is annoying right at eye level. If you want a view, you’ll have to bend down the entire trip… or just sit in the low floor section. The windows are also lacking in stickers to keep them closed for the AC, which makes me wonder how good it is on the electric fleet. 3801 on layover at Washington Square Transit Center. While the seats do look the same as the rest of the bus fleet, I’m not sure that they are, as I don’t recall seeing branding on the seats on any other bus. They are also incredibly flimsy compared to the rest. I suspect material was stripped out of them to make the bus interior lighter to accommodate the heavy battery pack on top. That said, you will feel every single movement of your seat partner, if you have one, and the seats bend back a fair ways if someone grabs on to them. They are comfortable, but their build construction has room for improvement. The next stop sign on my bus also had a tendency to cut out… a lot. For a very new bus, it was concerning to see it reboot about every three stops. The text was also very out of sync with the audio for some stops as well. The stop request light also came off as very dim. I hope both of these issues are something TriMet and NewFlyer can fix with a software update. Ride-wise, apart from operators still getting used the the brakes, 3801 is perhaps the smoothest ride you’ll get on a TriMet bus right now. The bus is silent on the outside, which did result in some passengers not realizing the bus was arriving, but inside you will hear motor noise when it gets up to speed. It’s comparable to a Type 5 MAX or other electric vehicle, and certainly much quieter than the rest of the fleet. There is only one charger on the alignment, the one at Sunset Transit Center, which will give the bus a full charge in about 15 minutes. While the bus should be charged every time, it is capable of two full trips on a single charge. 3801 gets a charge for its last run of the night. Overall, I was very happy with my ride, especially considering I trekked over to Sunset to literally just ride 3801 when I heard it was finally on the streets. The bus itself seems to work very well and offers a pretty pleasant journey, save for a few design things I would change for the second series of electrics, should we ever get more. I very much look forward to seeing the other four planned electric busses enter revenue service, and I hope they work out better than TriMet’s past experiments with electric (including hybrid) busses. If NewFlyer makes a 30-foot variant, I would absolutely love to see electrics on line 63, but would more than welcome them being added to any route. 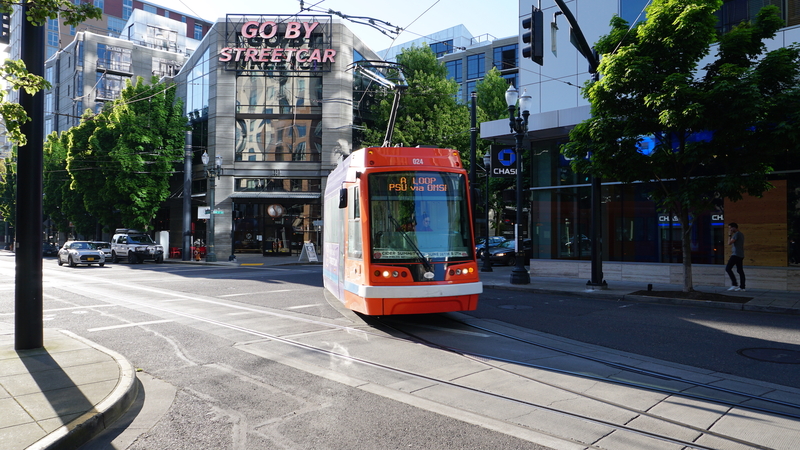 Hopefully, 3801 marks the beginning of an exciting future for TriMet. 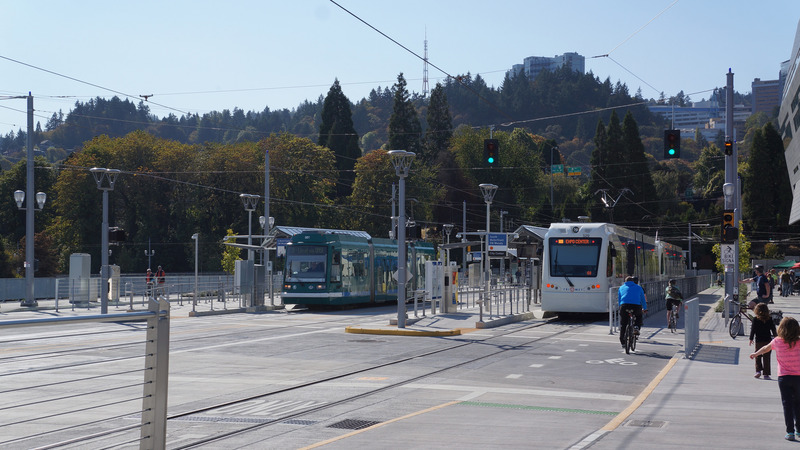 Update: TriMet officially announced the electric busses were in-service on April 16th. 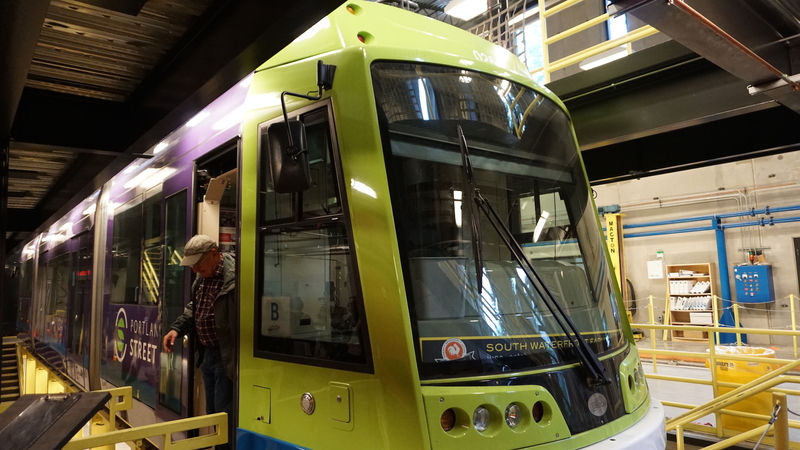 3802 has been delivered, and the remaining three busses are expected to arrive in late April. While it doesn’t feel like this second year in Portland went by quickly, 2017 definitely feels like it went by quickly. Two months in, the HOP beta has been going extremely well. Previous post Picture Post: Marathoning the rest of the "Made in Abyss" #anime before the movie later this week. Next post Picture Post: Happy first day of Spring!